JESSICASMITHTV Success Story #3: Claire W.
We’re so excited to begin sharing some of our community members’ success stories with you. This week we’re thrilled to share Claire’s accomplishments — be sure to show her some love in the comments below! About Me: I’m 28 (almost 29) and I live in the UK with my husband and 2 boys aged 7 and 5. I work as a teaching assistant in a local school. My weight loss tipping point came in January 2015 with the realisation that my ‘baby’ was turning 5 that year and had I no excuse to be carrying the baby weight any more. I always wanted to be more of a role model in my boys lives and having them watching me eat healthier and working out was a big motivation. My #JSTVFit Story: I found your YouTube channel by accident one day whilst searching for low impact workout videos. I was very unfit and needed to be broken in gently. I started off doing a lot of the walking videos and slowly building up to a few barre and kickboxing videos. I slowly began to feel my strength and stamina build and now will happily attempt any of the hundreds of videos you have uploaded. My Favorite #JSTVFit Workout: My favorite by far is HIIT Cardio and Core! I love the fact that by the end I’m a massive sweaty mess but feel so energized! Superset sculpt is another massive favorite too, Jessica’s happy and bubbly character really helps get me through all those squats! Peanuts always a brilliant distraction! Love to Peanut! The best healthy living advice I can share is: A piece of advice is you can’t out exercise a bad diet. So if you really want to get fit and lose weight you need to be aware of what’s going in to your body. My most exciting results: I’m around 7 lbs. off my goal weight. I have lost 10 inches off my waist going from 38 inches to 28 inches, 8 inches off my hips from 45 inches to 37 inches. It still boggles my mind that my hips are now smaller then my waist used to be! My strength and stamina have improved so much. I still need to work on my flexibility though, so will be doing a few more yoga and stretching videos. Which workouts did you start with? Just started the WALK ON (3 Set super DVD) today and I really struggled! Mary H. You posted this on April 22. How are you doing? Are you still exercising every day? I started to pure barre classes a couple days ago and already can feel the difference in the toning of my total body. I subscribed to your site so that I can work out with you daily. I have gained in weight but feel the difference in my body and know that well hopefully my weight will come back off because due to BMI at my work this can cost me more on my insurance. I’m 5’6″ and have to up under 180 for my BMI to meet their requirements for me to get the discount. Looking forward to my work outs with you in the future. I have recently started working out with Jessica Smith too. Love exercising with her. Success stories like yours make me want to keep going. I know i can lose the weight like you did. Thanks for sharing your story. You look great!!! Way to go, Claire!!! You have found it in yourself to change and you’ve done amazing!! You look fabulous! Keep up the work, it pays off as you can see. I first found Ms. Smith on ExerciseTV, and then they took that off of Comcast OnDemand. Grrr. A couple of years later my son received an Xbox for Christmas and I found out that I could watch YouTube exercise videos through it!!! I am very dedicated and diligent about working out at home so I started searching some of the trainers and was so excited to find SO MANY by Jessica! I love the fact also that by subscribing to her channel I get her new videos instantly. She has a great attitude, makes exercise fun and challenging, and her dog Peanut is just too much sometimes. So cute! Happy new year! Hi Claire, You look absolutely fabulous! I too, found Jessica looking for low impact workouts. She is just so wonderful. I don’t get excited about too many things, but I tell everyone about our Jessica. Fit and fabulous should be our mantra! Keep up the good work! On a side note, i purchased Jessica 4 DVDs and these workouts are a little more difficult than whats on You Tube, so when you up for it, I would recommend purchasing. You’re an encouragement to me to keep going. I started and stopped and now I’m motivated to keep going. 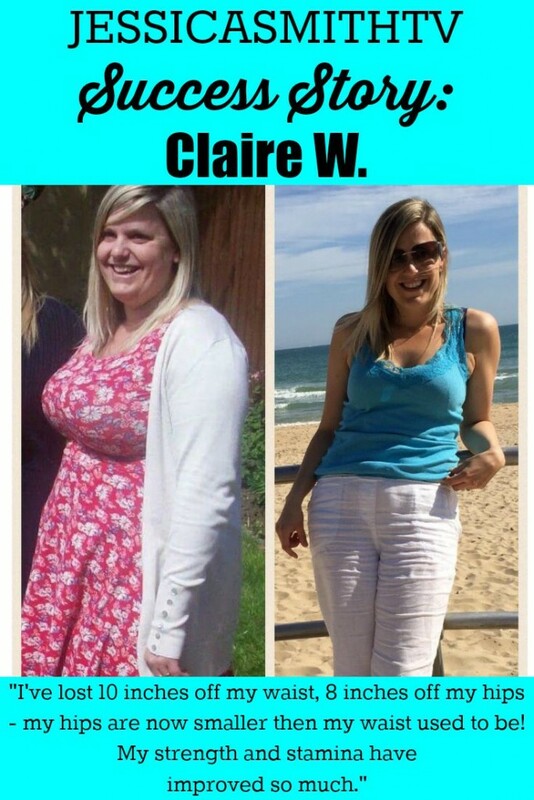 Good job Claire, great results, love your advice “you can’t out exercise a bad diet”, keep it up ???? Claire you look amazing and your story is such an inspiration to others. Your excellent example for both your own children and the students you support in school is wonderful. You will shift that final 7 pounds I am sure. I am a Brit too and being a Brit as you know we don’t normally use this word but you are so I will. You are awesome! You look wonderful, Claire! Great job! My weight also came from baby weight that never left. So true you can’t out exercise a bad diet. Thank goodness we all found JSTV! Claire you mentioned something very important; the foods we consume, along with exercising we must change our mind about How, What we eat…. we become healthy from the inside out. I congratulate your diligence, discipline, responsibility, accountability… you are now reaping the rewards of your hard work!! You look fabulous! Enjoy! Hooray to courage! I can definitely sympathize with having that baby weight stay around. That was a big motivating factor for me too. Those first few years go by so quick and it is hard to shift focus to yourself. Looks like you have had a lot of success! Well done!! Way to go, Claire! A good example goes a LONG way for kids rather than saying one thing and doing another! What an accomplishment! Congratulations. You’re an inspiration to keep going, keep at it. You look fabulously fit. Thanks for the inspiration. It helps keep me going. Well done, you have worked so hard, what a great role model for your kids. You look fabulous, Claire! You are truly inspirational! Thank you Robin. So pleased to almost be at my goal. ???? Way to go Claire! :)) I am from the uk too, I love JSTV plus peanut. You have done amazingly well. its amazing what you can achieve in your own home, Jessica’s videos are great when you need a fitness challenge too, I always come back to them.